Hi... to all you beginning Clawhammer players!!! Foot Stand- This is an adjustable stand designed to raise your left foot 4-6 inches or so, to help you achieve the desired angle at which your banjo is cocked. Mine is almost perpendicular with my left shoulder. Capo- This is a necessary gizmo to allow a Clawhammer player to play in the many varied tunings of this style. I have used many different types and have settled on the Kyser. It is a one-handed type capo. You just squeeze the trigger and it opens to allow application to any fret. ($12-15) I have use the Shubbs, which has a set screw and locks down on the fret. It works fine, but leaves an indentation on my Bacon's fret board. (No matter what tension I set it to) ($15-20) I use a cheap Dunlop for my "At work" banjo. It has a strip of rubber mounted on a metal piece, that has 5 or 6 slots where you hook in the strap and lock it down. Not fancy, but functional. ($3-5) There are many types of capos; find the one that is right for you. Bridges- Like strings, there are many types of bridges. I have tried the "Enterprise" bridge by Nechville and found it to be kind of bright for the style that I play. I have also used the Moon bridges, which I really like. I have tried the light and medium 1/2" in the Moons and I like both. The medium seems to give the tubbier sound that I am looking for. My only complaint about the Moon bridge is that the ebonite seems to flake off and chip, especially on the 5th string. Right now I am using a compensated on my Bacon, that I filed down to almost nothing on the 3 legs. My action is low and this bridge needed to come down in size. It sounds okay, so why mess with it. If you live near a place that carries a lot of banjo bridges, go there and see if the owner will allow you to try out some of the bridges. It seems that every bridge is different, in the density of the wood, how much mositure it retains, how old the wood is and other assorted factors. It is great if you have the luxury of trying out different ones, to get the one that sounds good to YOU. 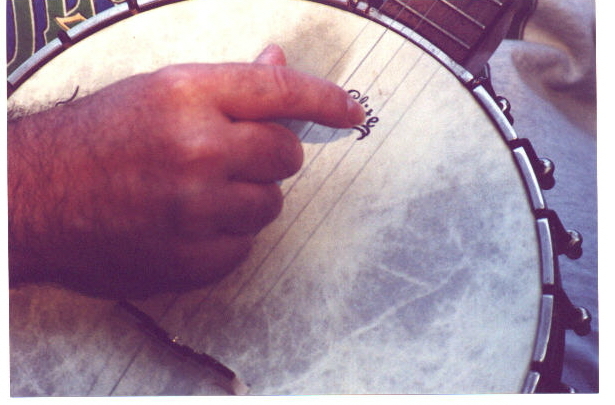 Slow Banjo Necks- Sometimes in the summer, when it is hot and sticky, the banjo neck gets very slow and hard to slide up and down. We have a very high humidity level in Rhode Island, many times above 80%. To help this problem I use a very soft rag to wipe down the neck and string between songs. I also use a product called "Fast-Fret" by GHS. You rub the stick over the neck of the banjo and the strings and almost instantly, you are able to slide and glide just like you used to... Works very well.. It claims not to damage the finish, but on my Bacon, it looks to have caused a little discoloration. It could be just wear and tear on the finish from being played for 70+ years. I still use it...just so I can play in the summer.